In this Feb. 19, 2013, file photo, OxyContin pills are arranged for a photo at a pharmacy in Montpelier, Vt.
OxyContin maker Purdue Pharma is exploring filing for bankruptcy as one of its options to address potentially significant liabilities from thousands of lawsuits alleging the drug maker contributed to the deadly opioid crisis sweeping the U.S., NBC News confirmed through a source familiar with the matter. Purdue denies the allegations, arguing that the U.S. Food and Drug Administration-approved labels for its opioids carried warnings about the risk of abuse and misuse associated with the drugs. The Stamford, Connecticut, drug maker has not made any final decisions and could instead continue fighting the lawsuits, sources told NBC News. 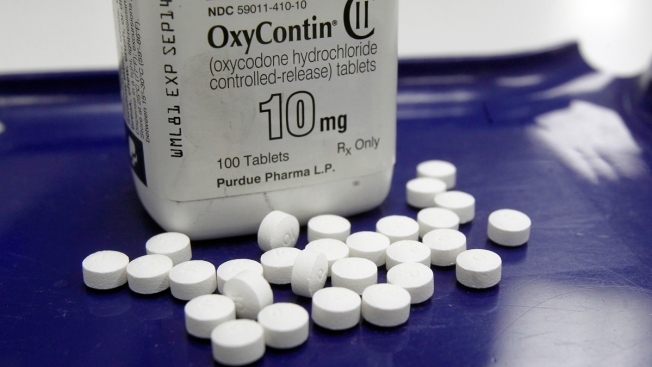 "As a privately held company, it has been Purdue Pharma’s longstanding policy not to comment on our financial or legal strategy," Purdue said in a statement. "We are, however, committed to ensuring that our business remains strong and sustainable."